The modern smartphone is an extremely versatile piece of law enforcement and tactical equipment, with communications capabilities, a camera, built-in GPS, as well as many useful apps. This tough pouch fits a phone up to five inches in height, and can also be used for radios, GPS devices and other similarly sized items. Its adjustable quick-release strap holds the contents securely in place, while also leaving space for an antenna. Its elastic retention strap expands to fit different thicknesses. Its sturdy spring-steel clip allows it to be worn in many different ways, including on belts, straps and pocket seams. 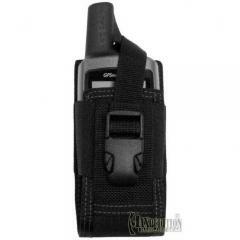 Replacing the clip with a three-inch TacTie makes it compatible with MOLLE and PALS webbing.